Born and Raised in Sharon Hill, educated in South East Delco School District and a Member of the first Graduating Class of Academy Park HS. Attended Mansfield University of PA, studied Business Administration and Accounting. Enlisted and served in United States Marine Corps Reserve April, 1984 through April, 1990, re-enlisted Dec, 1990 and Honorably Discharged February, 1993. Began my working career driving a delivery truck for Collingdale Millwork and Lumber in 1985. Joined the Teamsters Union in 1986. I then left the Union and struck out on my own as an Independent Trucker in 1989 and I truly struck out for the next four (4) years I struggled to pay my bills. 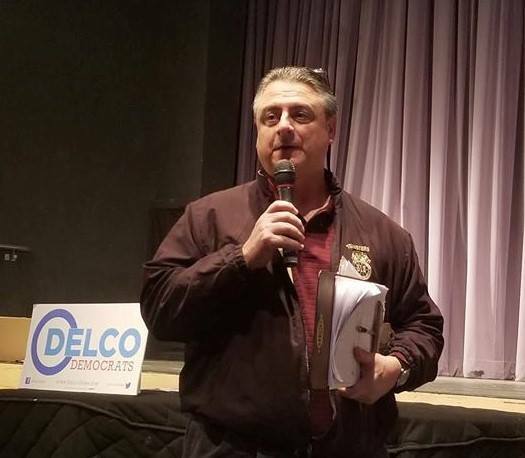 In early 1994 I went back to a Teamster job, hauling new cars in Twin Oaks, Pa., and have progressed through my Union from Shop Steward to now President and Principal Officer of Teamsters Local 312 in Chester, Pa. I have served at the pleasure of the Members for 10 years now. I have been married to Susan (Collingdale/Prendie) for over 26 years, we live in Ridley Twp. We have two children, Danielle (RN, working full time and studying for her BSN at West Chester) and David (2nd year student of Communications at DCCC while working 30 hrs. a week). I am running because I love my kids, my Country and my Commonwealth and I am afraid all three have not been served well in the political arena nor are they in better shape now then when I encountered each of them. I am running for the working person, the wage earner. I am repulsed at the idea that $15 per hour is a livable wage and that an Employer’ somehow figures they have an unalienable right to exploit your labor for such a measly sum in this State, where politicians cower in front of big business and bend to the will of Industry as if the Commonwealth is to be run at the behest of Big Business and not for the Common Citizen. I am running because you are not the “Forgotten Man” you are the “Forsaken Man.” Politicians don’t “forget” you nor does Big Business. They “forsake” you. They see you as wall paper, as fabric on the furniture, you are always there until you are not and then, they just get another. I see you, I am you, you will not be forgotten as I will not allow myself, my wife, my children, nor you to be forsaken. I want to go to Harrisburg and represent a Class of people that are tired of being forsaken. I want to work towards fair wages, benefits, health care and a dignified retirement in a community of clean air, water and land. A Class of people that demand equitable taxation with full and fair funding of our Public Schools. Without mixing any words, I’ve decided to run to make a difference for people like me. People that are as close to the edge of prosperity as they are close to the edge of poverty. I am concerned I will not leave a better world for my children then the one I was delivered in to. I want the peace of mind that comes with the satisfaction of knowing I climbed in the arena. I am asking for and look forward to your support."